How To Clean Bath Toys - Get Rid Of Mold Easily! How To Clean Bath Toys – Get Rid Of Mold Easily! It’s bath time for the kids. You fill up the bath, chuck them in (not literally) and get out their bath toys. Then you remember – you forgot to clean them again! They are all dirty, moldy and to be honest a little slimy right? Well time to throw them out…..
NO….WAIT! There is another option. There are a number of ways to clean bath toys and to return them to their former glory without needing to resort to the trash can. Firstly, I am not saying you are bad housekeeper for letting the bath toys get that dirty. After bathing the kids, getting them dry and dressed and moving through their nightly routine it is quite easy to forget! I am guilty of this myself. Hence me writing this article on how to clean bath toys…because I found myself in this exact situation. Impressive hey? It looks new again! How did I achieve it? Well there are a few ways you can get similar results. Read on to learn the exact method. Numerous studies from around the world have shown a link between living in a home with mold growth and adverse respiratory symptoms in kids. Some studies even show that mold growth in the home can be linked to fatigue and headaches. And if you want to go into the even scarier side, then is has even been suggested that excessive exposure to mold can lead to “increased risk for hemorraghic pneumonia and death among infants”. Now to be fair – that is at the extreme end of the scenario (think the moldiest environments someone might live) and there is no need to panic. But you should do your best to remove mold where possible. So how do you clean those moldy bath toys? Well there are a number of ways to get those toys looking like new again. Whether you are looking for the best way, or a more natural way to clean moldy bath toys. Keep reading to see what got us the best results. This was clearly the stand out method for us. Using bleach produced the best results and the toys came up almost like new. Wait! I hear you say – I don’t want my children exposed to bleach! Simply washing your bath toys in clean water after the bleach treatment leaves on minuscule amounts on the toys which reduces the exposure your kids have to bleach to almost zero. Bleach also kills not only mold, but bacteria as well. Place the toys in the solution an immerse them. Use something to hold them down if you need to (I used the bottle of bleach!). Also be sure to let the toys fill with bleach – this will ensure they are cleaned inside and out. And that’s it! Easy hey! If you are looking for a bleach-free way to clean bath toys then vinegar is a good alternative. Vinegar is pretty good at killing mold and also has some antibacterial properties. 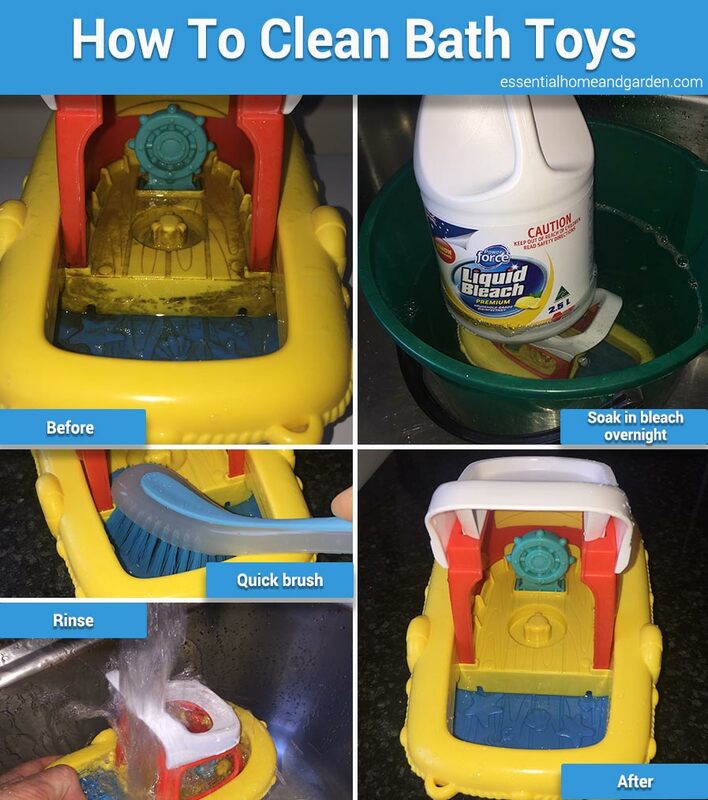 There are a couple of other ways to clean your moldy bath toys, but in our opinion they do not work anywhere near as well as with bleach. The first way is simply to throw them in the dishwasher. It probably wont get rid of all the mold – but it does an ok job. The second way is to boil the toys. Put a pot of boiling water on the stove and sit the toys in it for 10 – 20 minutes. You will still need to scrub them to remove some of the gunk. 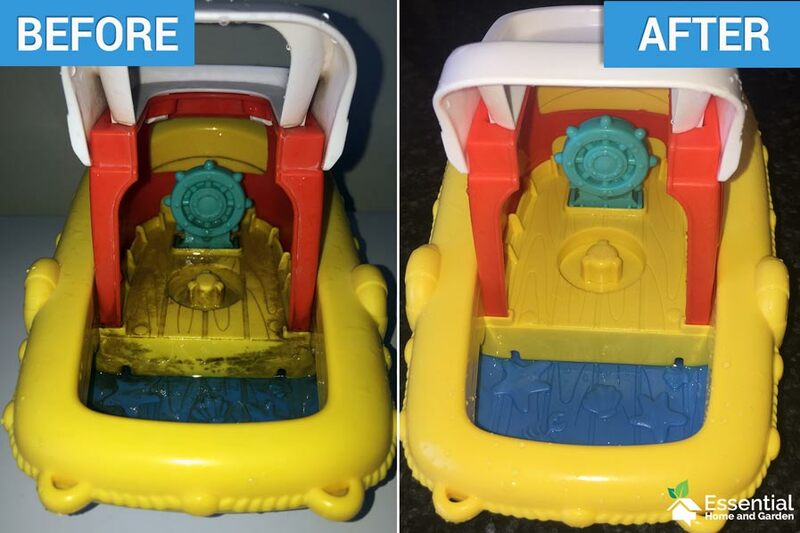 As always, preventing the mold from growing on bath toys is better than having to clean it off. 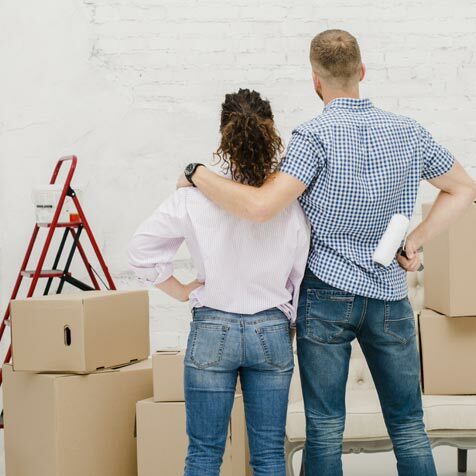 So here are a few tips to help you avoid mold in the first place. Some toys are not fully sealed, and this means that water can get inside. And if water can get inside then mold can grow and you won’t even know it is there! If your toys have any holes in them, then seal them with a hot glue gun or even some silicone. This will prevent water entering them all together. Of course, you can always purchase pre-sealed bath toys and avoid that hassle. Allowing the toys to sit in moisture and not dry out in between uses is a sure way to grow mold. Storing the bath toys correctly can make all the difference and keep them squeaky clean. 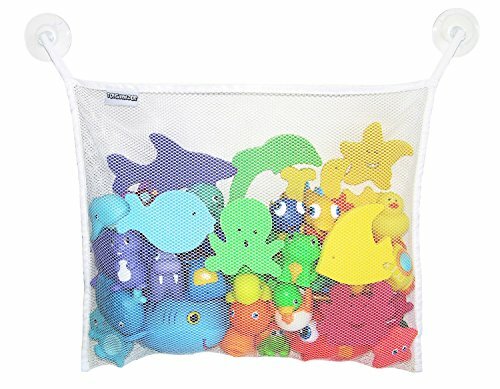 Use a bath toy organizer that sits out of the bottom of the bath and allows the toys to be well aerated and dry out.